Reminder: GGNRA Comment Period Ending Soon! The clock is ticking to tell the Golden Gate National Recreation Area what you think about their Dog Management Plan; public comments are due by February 18, 2014! You can see access will be drastically cut, with cuts represented by the red on the map. The green areas are the only areas dogs will be allowed off-leash, a mere fraction of the current off-leash area. And it’s not just Fort Funston! Crissy Field, Ocean Beach, and other National Recreation Areas in Marin and San Mateo are also under the gun. In all, the proposal would cut access by almost 90 percent. Some dog advocacy groups are trying to go over the GGNRA’s head; they wrote a letter to the Secretary of the Interior asking for help appealing to the GGNRA, which they say is ignoring blantant opposition to the plan and failing to manage the land the way it was intended when the city handed it over in the 1973. This entry was posted in K9 News and tagged Bay Area parks, Fort Funston, GGNRA by jaqbennett. Bookmark the permalink. Thank you for posting the map of Fort Funston , I find it a priceless resource from Rocky when I am out talking to folks who do not know what is going on with the 2013 SEIS Dog Management Plan, they only see whats on the GGNRA sandwich board only at four places at Fort Funston new nothing until someone puts a card in their hand while asking if they know about the Dog Management Plan. and often less than 50% of our contacts made know about the 2013 SEIS, they often think it was settled back in 2011 with all the work and 4700 comments against the 2011 DEIS were posted and only a few were selectively made public by the GGNRA..
P wanted to remind folks who post their comment on the GGNRA web site to either make a copy of their comments or write the comment file number which is on the bottom left side of your comment page after it has been processed. I wanted to add a correction though small it could mean a lot down the road, that is we/I have been telling folks on the Informational Cards and my latest Comment to the GGNRA is to ask and demand that the Original 1979 Pet Policy be restored as the rule of the land with respect to a Dog Policy that was worked out by honest stake holders in 1978/1979 and worked so well until new management arrived to the GGNRA in 1992.It was under Mr O’Neil’s leadership as Superintendent of the GGNRA that they started closing small sections at Fort Funston and when they were done they had tore up Ice Plants and trees that had been stopping the erosion in the 12 acre north/west corner of the park. They put up fences gave out tickets if you crossed the line . What was the most important result of tearing the Ice Plants out close to the edge of the bluff was that the rain that year saturated the bare land at the western edge of the bluff got water logged and erosion brought on by GGNRA actions ruined the Cliff Dwelling Swallows habitat on the western edge of Fort Funstons cliff face .. The GGNRA Management did more harm to the Cliff Dwelling Swallows habitat than a thousand dogs could have done if the dogs were inclined to rip out the Ice Plants at the Bluffs edge at Fort Funston of which they are not.. Another tragedy is when they pulled trees and Ice Plants the sand moved at such a fast rate that it now covers the fences and the Sunset Trail which are now covered in deep sand and the GGNRA uses this as an excuse to remove the trash can that was chained to the North Bench at the very north end of the Sunset Trail. This loss of service at this end of the park has created problems for all dog walkers who clean up after their four pawed pals and walk that way and then onto the Horse trail to hike south to the closest trash can by the stair case to the fountain on Battery Davis Road. For myself this represents a type of disenfranchisement that the NPS/GGNRA is perpetrating quite deliberately in their quest to take away any kind of dog walking in these National Recreation Areas that have had special enabling instructions to allow for the needs of over 1,000,000,000 residents in the three Bay Area Counties, San Francisco, Marin and San Mateo Counties with respect for living up to the MOU between the City and County of San Francisco and the GGNRA Next time you are at Fort Funston at the Skyline and John Muir entrance, there is a Fort Funston Badge/Crest from the NPS and on the bottom line there are images of the activities allowed and a few not allowed like overnight camping just like a residential park. What is telling is the lack of an Image of a Dog with or without a leash and a person. 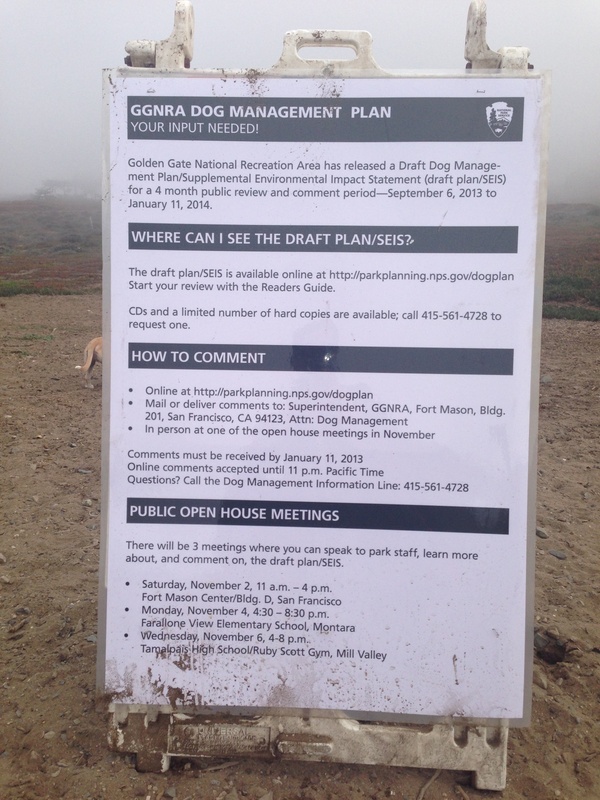 With this and the lack of services like restrooms and trashcans at Fort Funston and Ocean Beach and the lack of a dog on the Entry Badge along with closing more areas for Dogs to run free is all part of the GGNRA’s way to un-welcome /disenfranchise everyone with a dog at Fort Funston and Ocean Beach. The City and County of San Francisco Board of Supervisors has passed resolution # 386-13 against this 2013 SEIS DMP listed as 131002 on the Oct. 29, 2013 BOS calender. Mayor Lee also came out against the GGNRA 2013 SEIS ..
131002 [Opposing Golden Gate National Recreation Area’s Draft Dog Walking Access Policy] Sponsors: Wiener; Tang, Breed, Avalos, Campos and Chiu Resolution opposing the Golden Gate National Recreation Area’s (GGNRA) currently proposed preferred alternative for dog management; and urging the GGNRA to adopt a different approach. Supervisors Campos and Chiu requested to be added as co-sponsors. 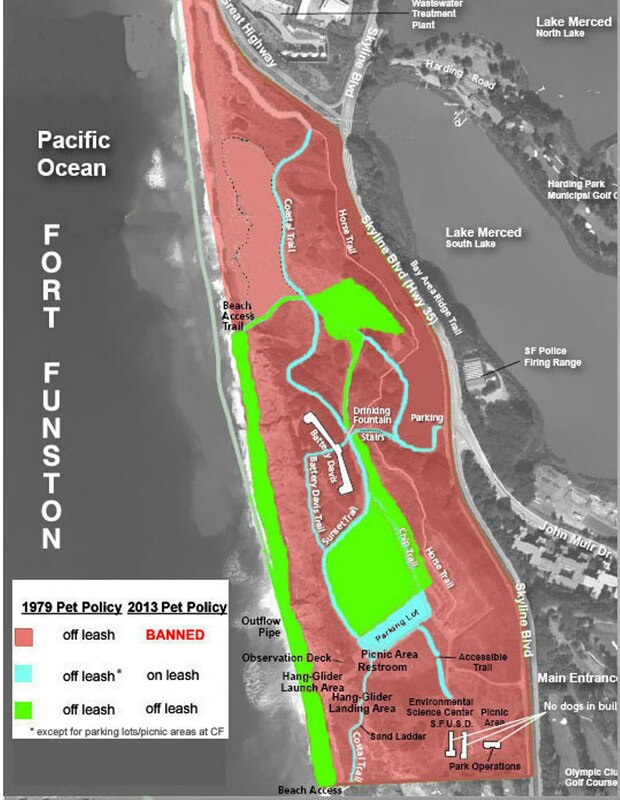 The Original 1979 Pet Policy will open up this 12 acres at Fort Funston, the area at Ocean Beach closed from Staircase 21 south to Sloat Boulevard. where as just the 1979 Pet Policy will leave things close to their plan A which would defenitly leave these areas closed to dogs on or off leash just like the Red Sections in the Fort Funston Map.